The 20 Year War Between Ethiopia and Eritrea Has Ended, Restoring Contact Between Separated Families. Last week, thousands of Ethiopians placed phone calls they had dreamt of making for two decades. 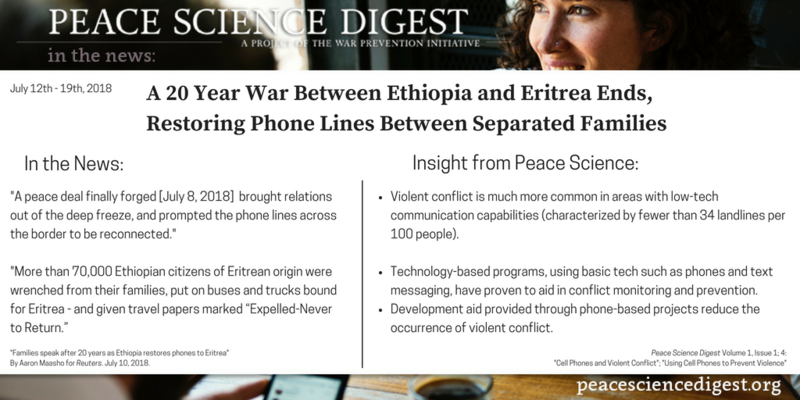 Following the end of the 20 year war between Ethiopia to Eritrea, phone lines have been restored allowing family members separated by the conflict to speak once again. Peace Science shows that access to phones decreases the occurrence of violent conflict. Violent conflict is much more common in areas with low-tech communication capabilities (characterized by fewer than 34 landlines per 100 people). The introduction of mobile phones benefit groups organizing in areas with middle to high standards of living. Access to mobile phones provide measurable assistance to organize for violence in groups under 600,000 people. Technology-based programs, as simple as phones or text message reporting, have been proven to aid in conflict monitoring and prevention. The costs required to collect conflict data via tech-enabled crowd seeding projects is significantly less than traditional methods of information gathering. Development aid provided through crowd seeding projects reduce the occurrence of violent conflict. “Families speak after 20 years as Ethiopia restores phones to Eritrea” By Aaron Maasho for Reuters. July 10, 2018.